Istanbul has an ancient beauty all it’s own. With an 11-day break from classes (apparently Easter warrants nearly two weeks of celebrations, me encanta España) I finally had a chance to check the two top cities off of my Most-Want-to-Visit list: London and Istanbul. These two titans of European travel topped my list for nearly polar opposite reasons. London seemed to be an obligatory stop. 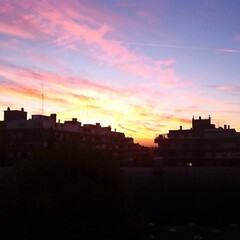 I’ve swirled Chiantis in Rome, savored croissants in Paris, devoured tapas in Madrid and danced the day away in Barcelona. It was about time I paid homage to the most visited city in the world and got my fish ‘n chips on in London. 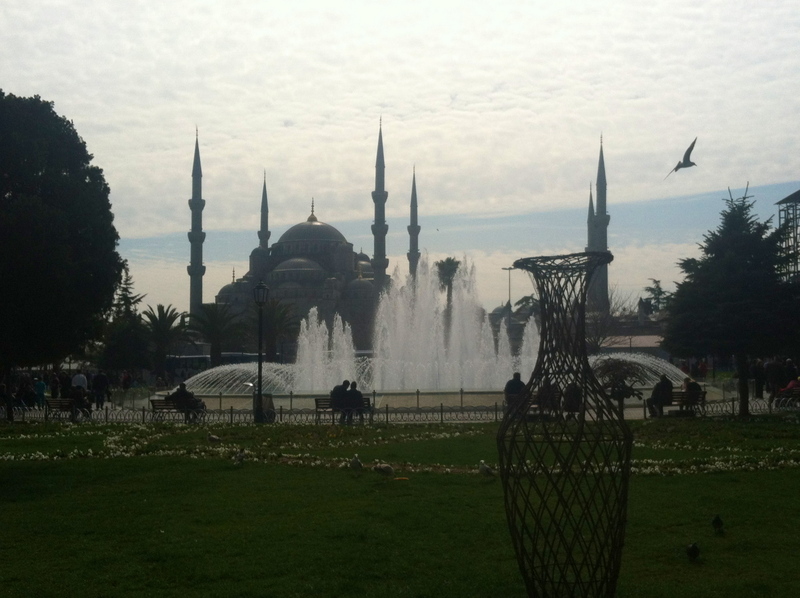 Istanbul, on the other hand, was the slow-burning obsession of my travel bug. The city represented everything I crave about international travel: utter newness, total uniqueness, vast history and, of course, fantastic food. Not to mention in my unscientific poll of travel-lovers (aka asking everyone I met), more people raved about Istanbul than any other city. To say I was stoked would be a slight understatement. 1. Flower beds? Try flower murals. Forget flower beds, Istanbul makes flower clocks! As far as flowers go, London doesn’t do too shabby. St. James Park near Buckingham Palace features immaculately maintained beds of bright yellow buds and rosy red petals. But from the moment I boarded my bus from the Sabiha Gökçen airport on Istanbul’s Asian side, I was greeted with the most magnificent display of flower landscaping I’ve ever witnessed. Huge swirls of bright pink and purple flowers decorated the hills lining the highway. Abstract murals of shrubs and buds flowed past the bus window all the way into Istanbul. 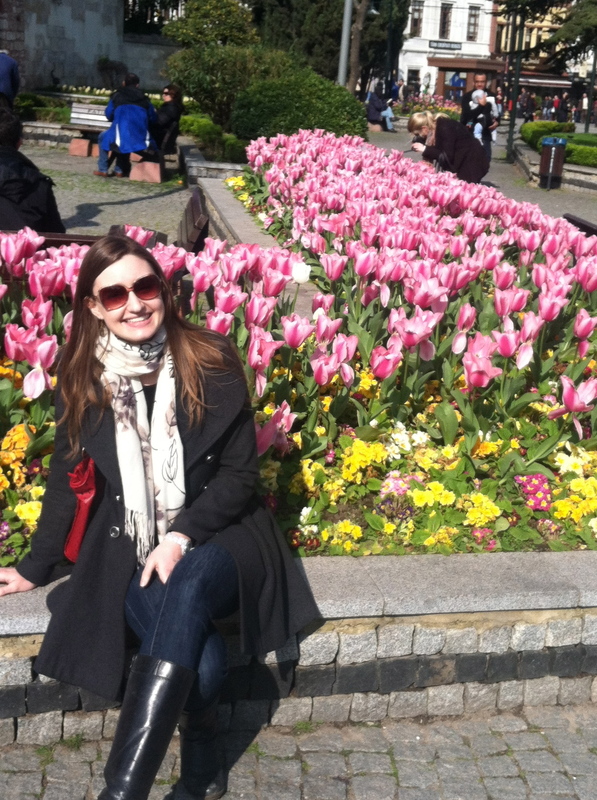 Sultanahmet Square was overflowing with gorgeous spring flowers! 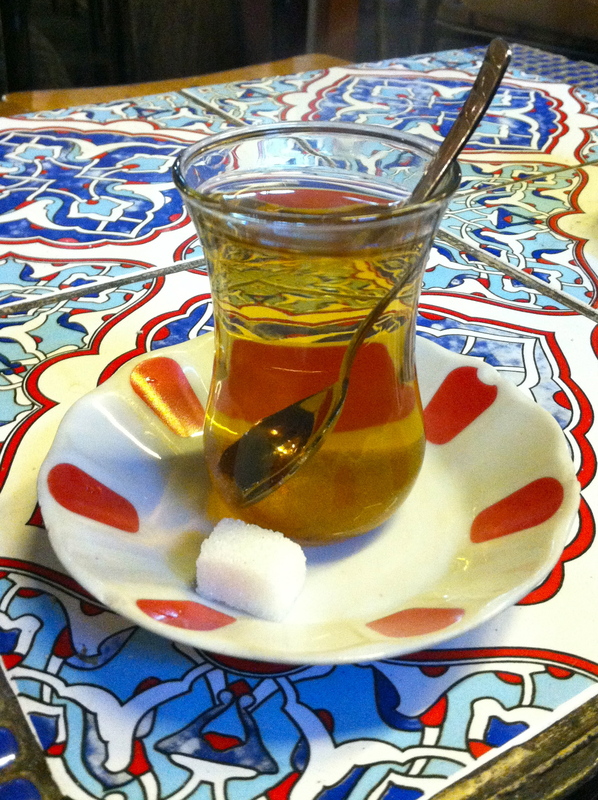 Turkish apple tea is sweet, tart and all-around scrumptious! The English may have cornered the market on traditional tea time, but the Turkish have taken tea to the next level. Clear glass vases of piping-hot Turkish tea are confined to no specified time, no organized location and no particular occasion. Tea makers are constantly scurrying throughout Istanbuls cramped and winding streets delivering trays of tea and lumps of sugar to shopkeepers, bazaar-stand workers and tiny stool-sitting customers. In Istanbul, tea (or çay, pronounced ‘chai’) comes in two flavors: Turkish and Apple. The former is an amber brown, bitter tea while the latter is light yellow and, as a friend described it to me, “sweeter than a jolly rancher.” Both are fabulous as are the perfectly palm-shaped glasses they are served in. In London, the treasures of the city are prominently displayed, whether it’s historical heirlooms in the British Museum, adorable and affordable styles in Primark or the queen’s crown jewels in the Tower of London. But in the chaos of Istanbul, the marvels of the city take a bit more searching to discover. 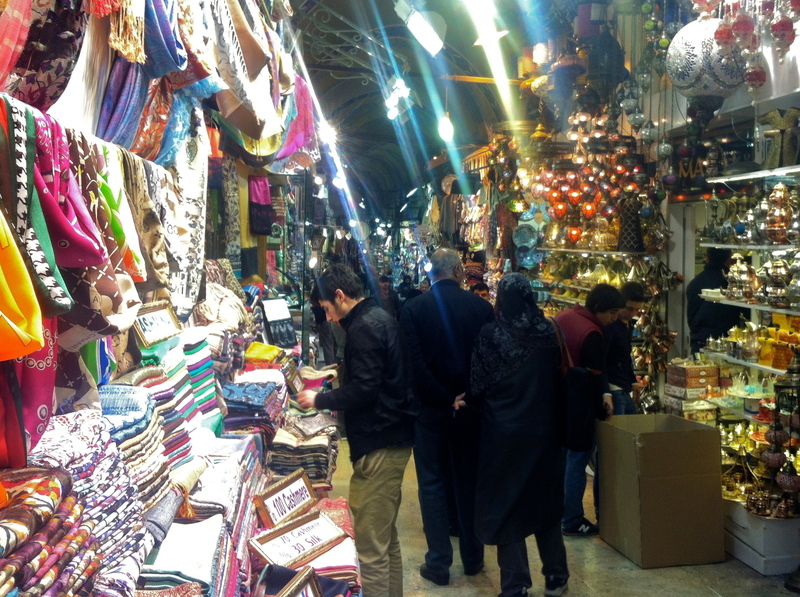 For me, the treasure hunting began in the Grand Bazaar, a nearly 600-year old labyrinth of 60 streets-worth of shops, stands and stalls selling everything from Genie-style oil lamps to handwoven cashmere scarves. Rainbows of scarves lined the streets of Istanbul’s Grand Bazaar. The true treasure, in my flavor-obsessed opinion, is two stops down the tram line at the Spice Bazaar, or as I have re-named it, Heaven. Picture this: a web of arched streets packed with people and overflowing with every color of spice, every type of Turkish delight, every scent of dried tea leaves and every variety of dried fruit. 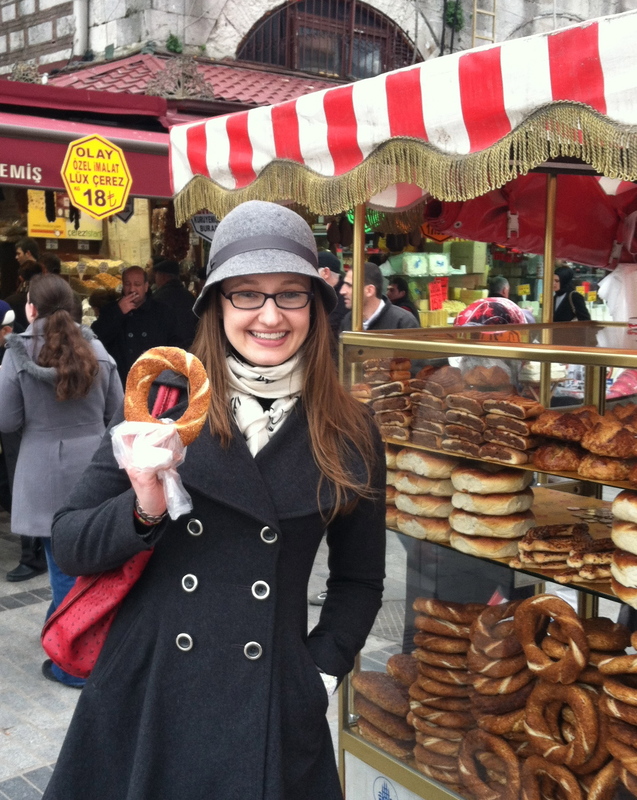 Istanbul sampled it’s way into my heart as I tasted my way down the streets of the Spice Bazaar. Two days of treasure hunting yielded two more items to add to my list of favorite foods: walnut-stuffed dried Turkish figs and roasted pistachio and pomegranate-honey Turkish delight. 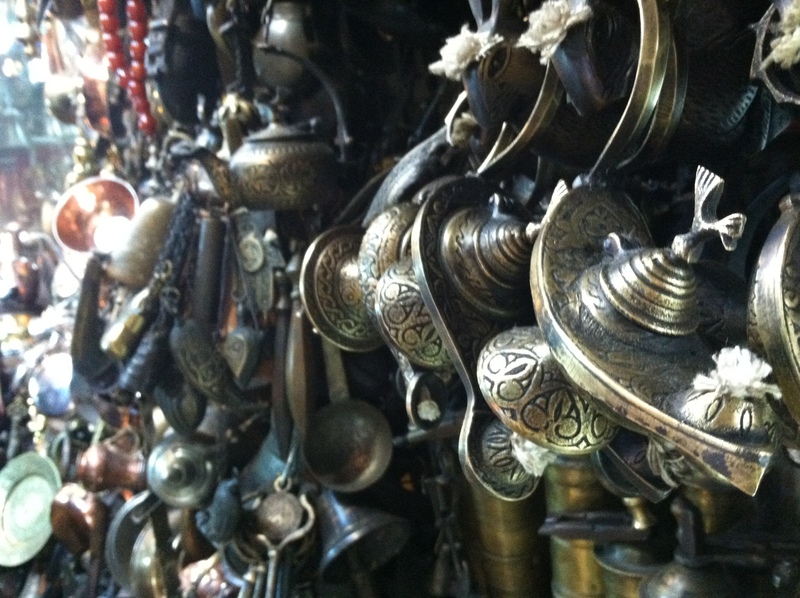 Aladdin-style oil lamps at the Grand Bazaar. 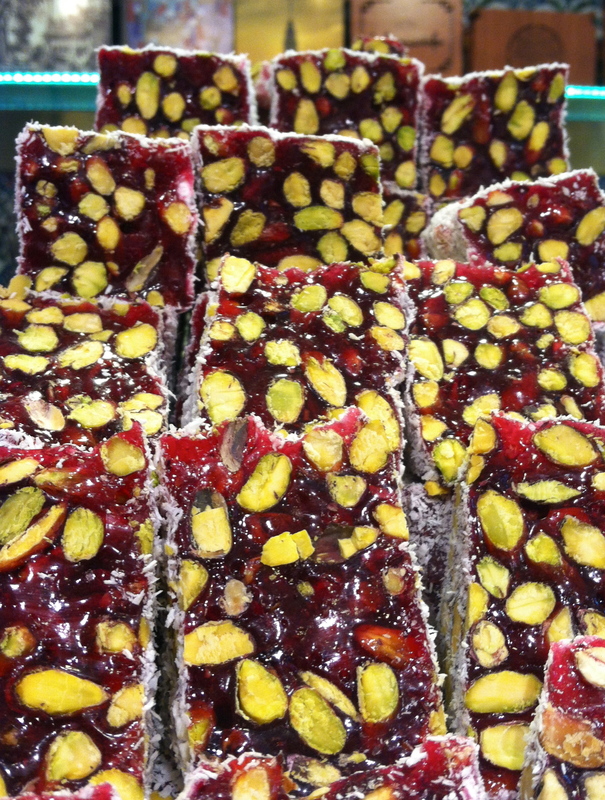 Ridiculously delicious pomegranate-honey-pistachio Turkish delight. English breakfasts — with their sausage, ham, bacon, fried eggs, baked beans and buttery toast — may sound good on paper, but after polishing off that heaping pile of goodness, the only thing I want on my day’s agenda is a nice long nap. Delish? Absolutely. 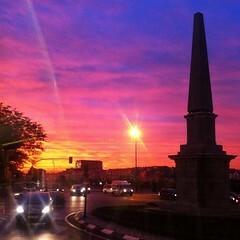 Conducive to exploring a new city? No way. 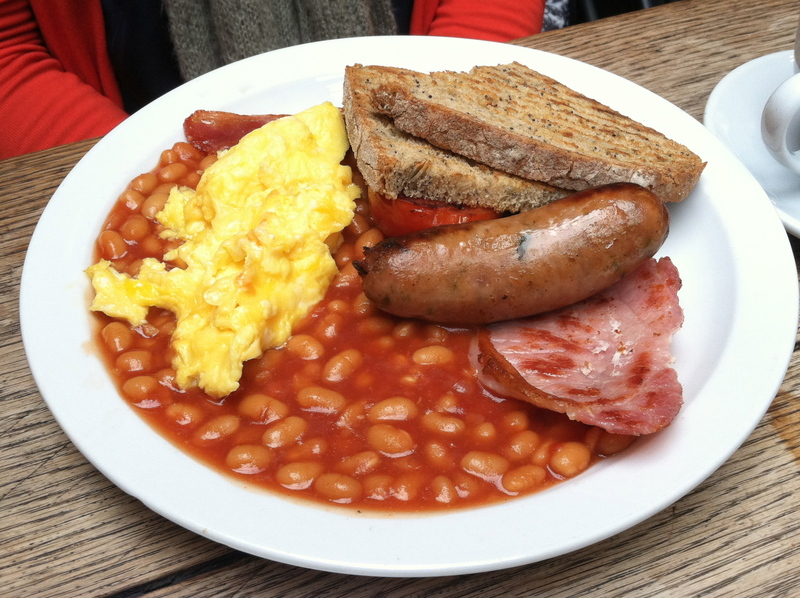 Eggs, baked, beans, sausage, ham and toast, the typical English breakfast. On the contrary, the typical Turkish breakfast — tomato, cucumber, tangy yogurt, feta-like cheese and bread — made for an unexpectedly invigorating start to a long day of mosque-ogling and treasure hunting. While it’s a far cry from what I typically think of as breakfast food, the fresh and flavorful vegetables paired with the salty cheese and flaky rolls were satisfyingly filling, yet delightfully light. 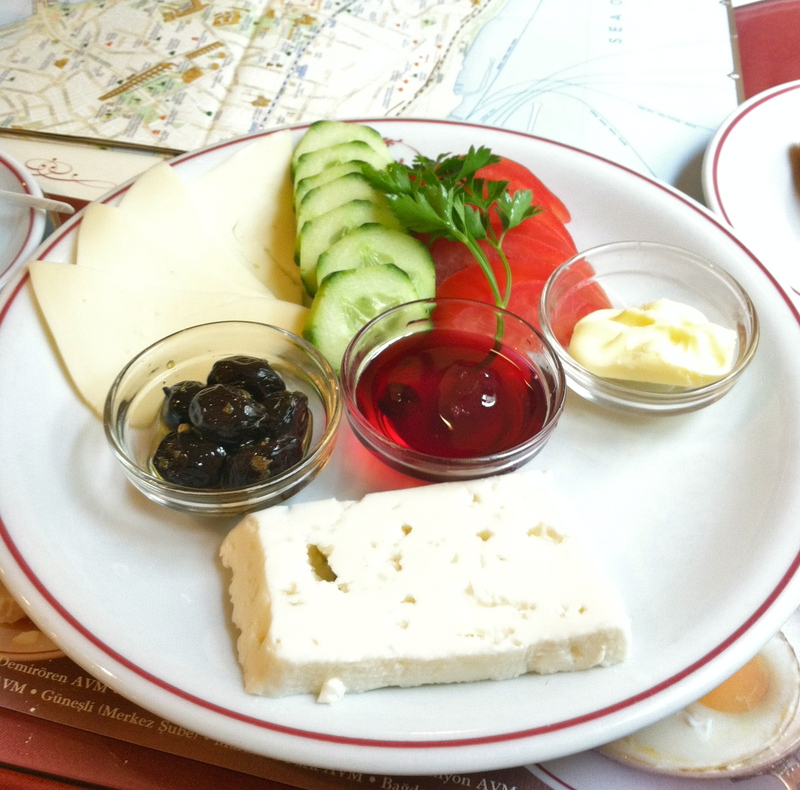 Two types of cheese, olives, cherry jam, butter, cucumber and tomato, the typical Turkish breakfast. I now have a whole new appreciation for street food. 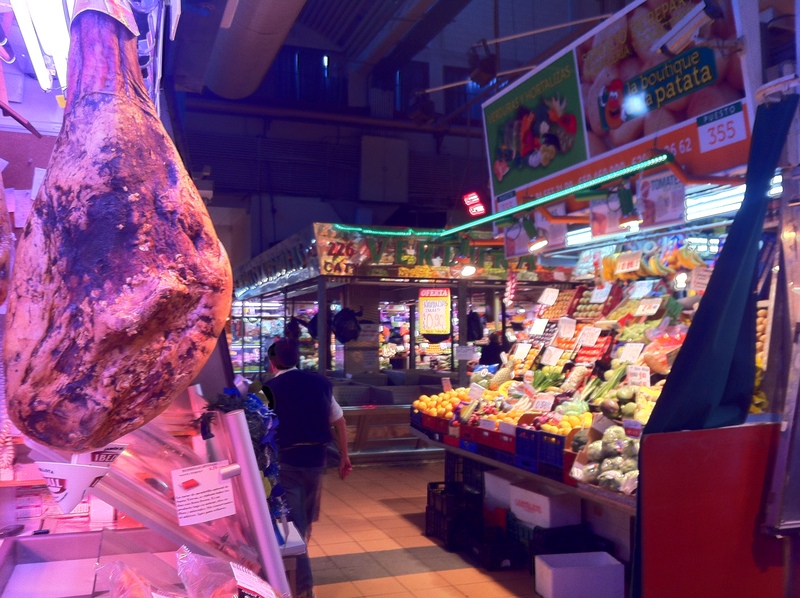 While Spain’s street-side roasted chestnuts are tasty, they don’t hold a candle to Istanbul’s sesame-covered simit (picture a thin, breadier bagel) or perfectly charred lamb kebaps. This bagel-like simit made for the perfect mid-morning snack! 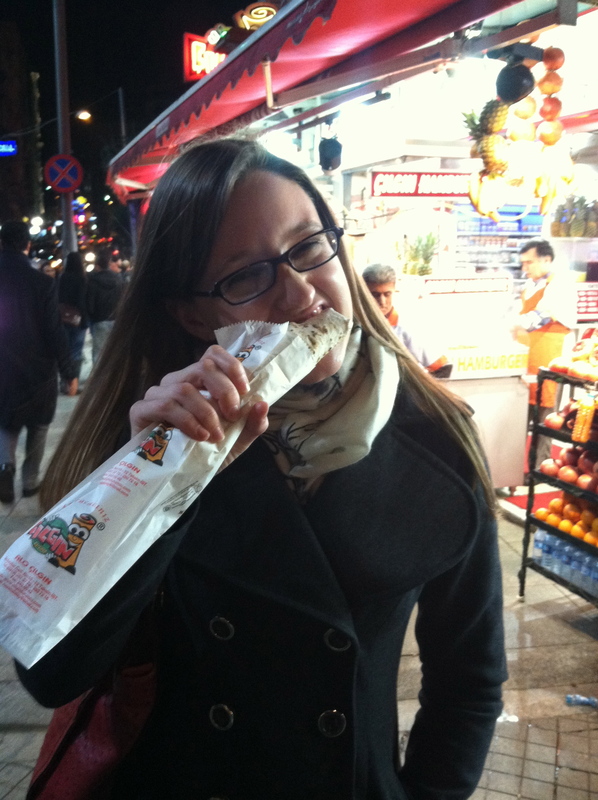 Istanbul’s lamb kebap: street food as street food should be! 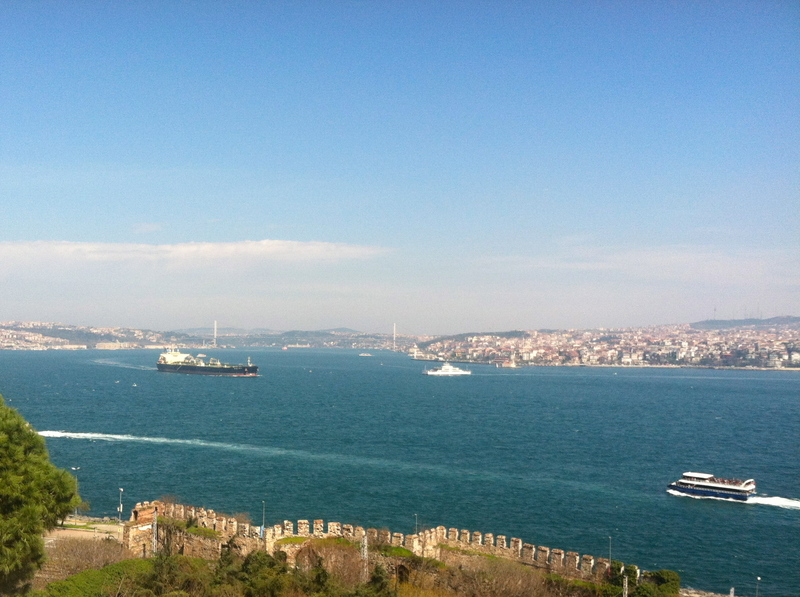 When it comes to city-dividing bodies of water, the Bosphorus Strait can’t be beat. Not only does it hold the trump card on the awesomeness scale of separating two continents, the Bosphorus is also magnificently teal-blue, is spanned by breathtaking bridges (especially when they are lit up at night) and bordered by an elaborate Sultan’s palace and stunning modern mansions. My day-long cruise up the Bosphorus to the Black Sea was easily one of the highlights of my trip. View of the Bosphorus from the Topkapi Palace. Just steps away from the Blue Mosque’s walls there is a unassuming doorway with an understated sign reading “teras” in neon letters. Four flights above that is the top of the world. 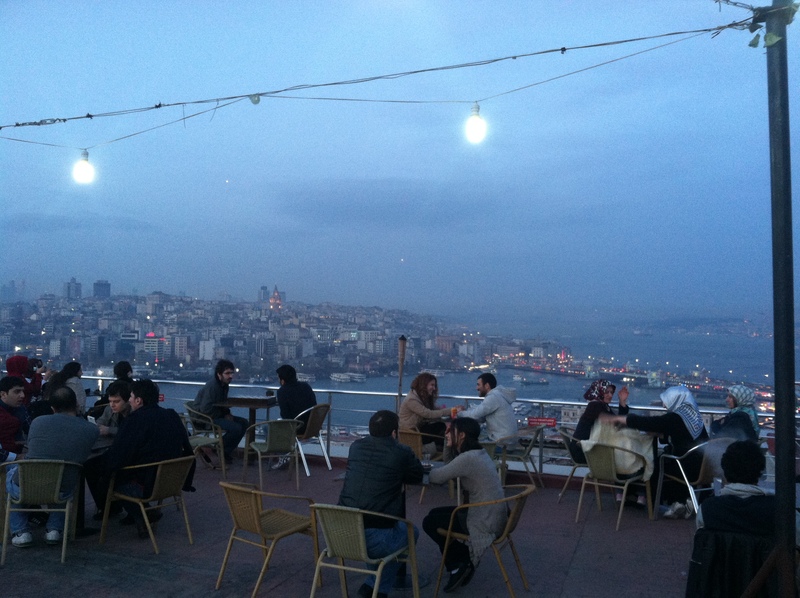 Moments before the dusk call to prayer rang out over Istanbul, I stepped out onto the rooftop terrace of Mimar Sinan Cafe. What greeted me was easily the most spectacular view I saw on my entire trip. Stretching out in all directions wast the behemoth city of Istanbul. Directly in front of me the newly-built skyscrapers on the Asian side disappeared into the clouds . To the right the spires of Istanbul’s most famous mosques encircled the ancient city. On the left sparkling bridges held the city, and with it two continents, together. Behind me the intimidating domes of the Blue Mosque lit up as the light faded from the sky. In that moment, I was on top of the world. Pictures cannot possibly do this view justice. I discovered this weekend that for the past 23 years I have completely underestimated how hard it is to cook Thanksgiving dinner. My parents are superheros for doing this whole thing in one day. 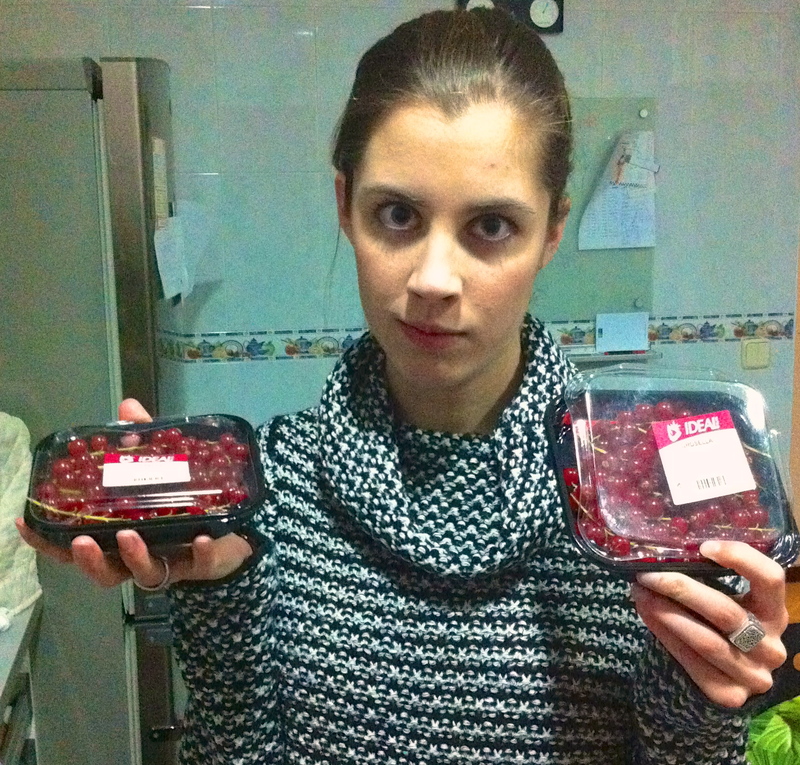 That being said, the following items do not exist in Spain and therefore made for some serious adventures in our Thanksgiving preparations: canned pumpkin pie filling, frozen (and featherless) turkey, normal pre-made piecrust, cornbread, fresh cranberries, measuring cups. Our epic Turkey Day adventure began on Wednesday, when (with the help of Victoria, the vice principal and English teacher at school ) I placed our turkey order. I had intended to order the pavo on Monday, but last weekend I was struck down with el gripe, which despite the doomsday sound to that word was a mere bought of the flu complicated by fierce Spanish medicine that I’m pretty sure did more damage than help. Anyway, I was back in action on Wednesday and one brief call to the egg and chicken delivery man (who sells poultry products to the elementary school’s cafeteria) later one super fresh pavo was en route to our Gracias-giving mesa. The elementary school chefs got a serious kick out of this American girl carting around a raw turkey. The giant, always fresh never frozen bird arrived Friday morning. 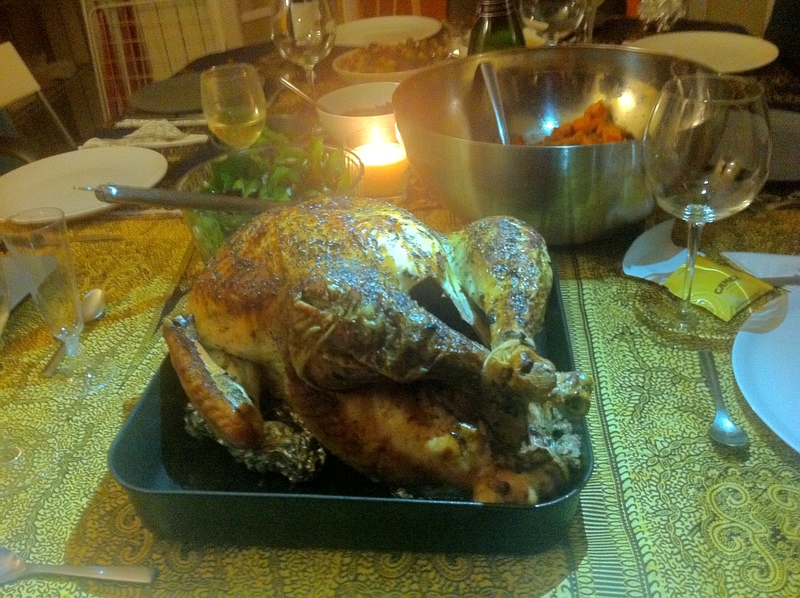 (Warning: stop reading now if you don’t want to hear about how turkey-like our turkey was.) This thing was walking last week, I’m convinced. It didn’t have feet, but it had scaly almost-feet ankels. And while most of the feathers were gone, they left us a reminder around each wing, where a smattering of white feathers remained intact. This was NOT a turkey like you find sterile-y frozen at H.E.B. I lugged Mr. Pavo down the river walk, through downtown Sarria and up three flights of our apartment building stairs with the scaly legs protruding from holes they had ripped in the oversized white grocery sack. 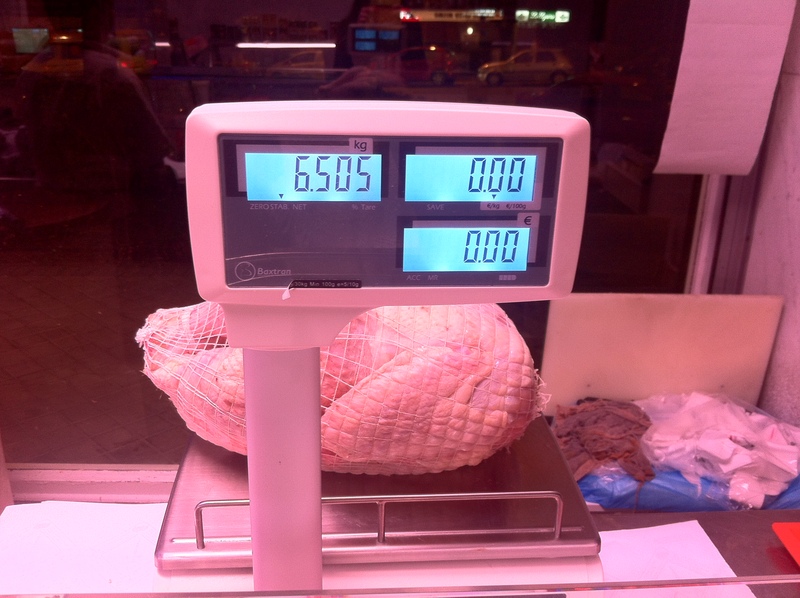 Since the turkey was bigger than our oven, we brought it to one of the best bakeries in town to have it cooked. 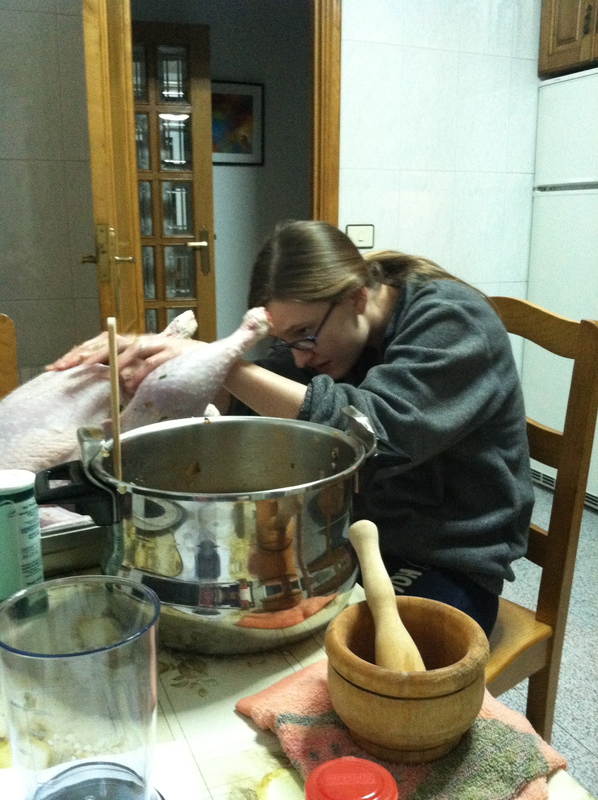 Turkey surgery. Harder than it looks. Next, with the expert step-by-step Skype help of Kurt and my mom, I managed to remove the half of a lung from inside (que. asco.) 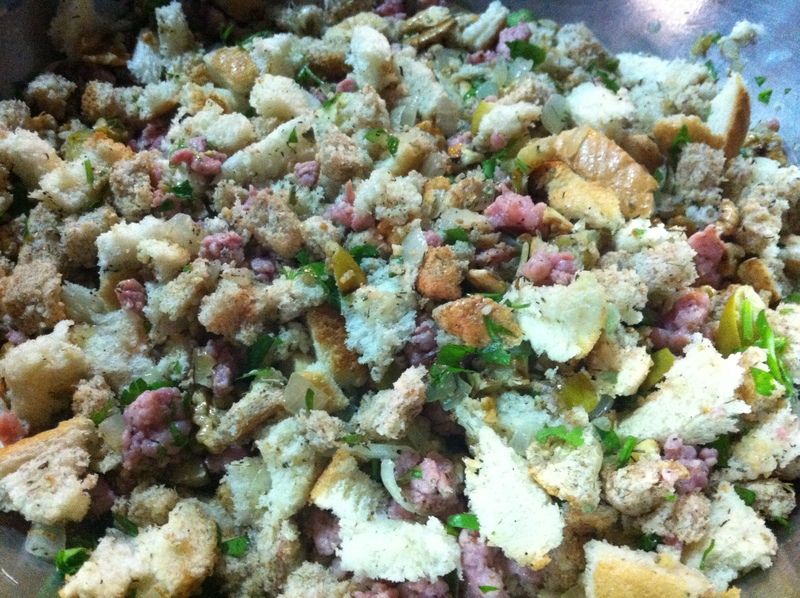 and fill it with scrumptious stuffing! The stuffing was an adventure in of itself because it called for 3 cups of cornbread. Sadly those handy blue boxes of Jiffy cornbread mix don’t exist here. My attempt to make it from scratch was an epic failure, so I ended up buying the densest, heavies loaf of “corn bread” I’ve ever seen in mi vida from a local bakery. Mr. Pavo was ready to roll around 2 am Friday night. At 10 am Saturday morning the turkey transport commenced. 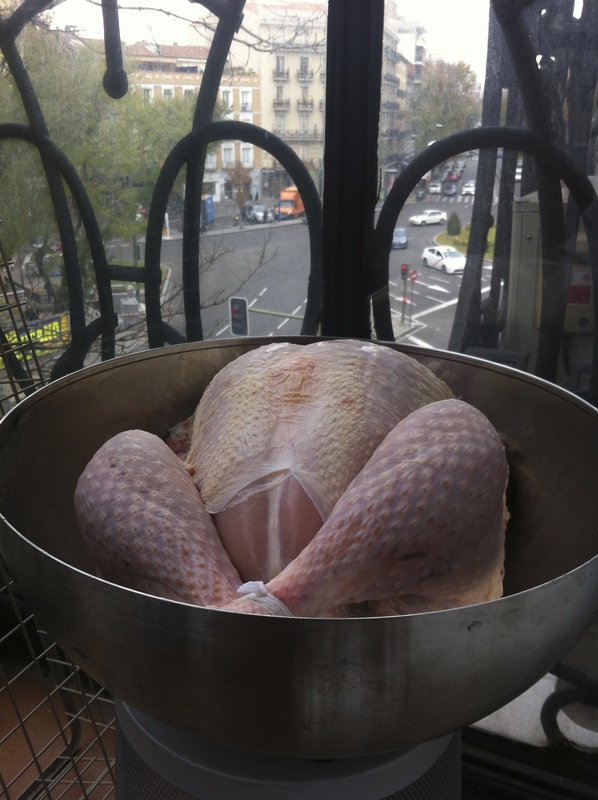 Picture this: the only two American girls in Sarria struggling to carry a huge pan of turkey down three flights of stairs and about 7 blocks to the bakers in a mild windstorm. Struggle. The pumpkin pie, which Kassandra successful constructed out of a real, live pumpkin, was a serious challenge because half of the spices came in whole, raw form. We had to bust out the mortar and pestle to pulverize the cardamom, cloves and ginger. Most of which was an epic fail. We finally broke down and bought a spice/coffee grinder. All in all it took us about 10 hours to cook the whole meal, which included: turkey, stuffing, gravy, mashed potatoes, cranberry sauce, potato salad and broccoli casserole with pumpkin pie and apple pie for dessert. With nearly everything ready and our Spanish Thanksgiving guests en route, we went to pick up the turkey from the baker’s. A large cardboard box dripping with aceite de turkey was waiting for us on the glass countertop, above chocolate covered galletas and Spanish-style donuts. Our anorexic, upside down Thanksgiving Day turkey. When I caught site of the beast inside I had a small internal panic attack. Our turkey had turned anorexic in the oven. The top was nothing but skin and bones. The entire back looked like it had melted off, you could see right through the ribs into the stuffing and the hip bones jutted into the air. My heart started beating again when I realized it was just upside down. Turkeys look seriously odd upside down. We invited seven friends from Sarria to partake in our Spanglish Gracias-giving and they were as excited or more than we were. 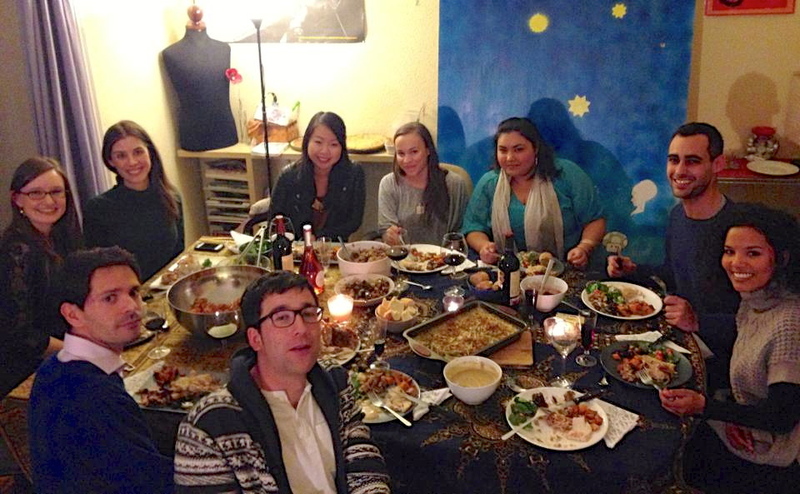 They’ve seen Thanksgiving celebrated in movies, and were stoked to experience it first hand. Pedro and Guille fought over the honor of cutting the turkey with Guille proclaiming he was “very fuerte, very very fuerte” and Pedro winning out once Guillermo realized that carving a turkey is hard work. Pedro didn’t quite get the concept of stuffing in one bowl, turkey in another, so we had one big plate/pile of stuffing mixed with turkey- still delish! 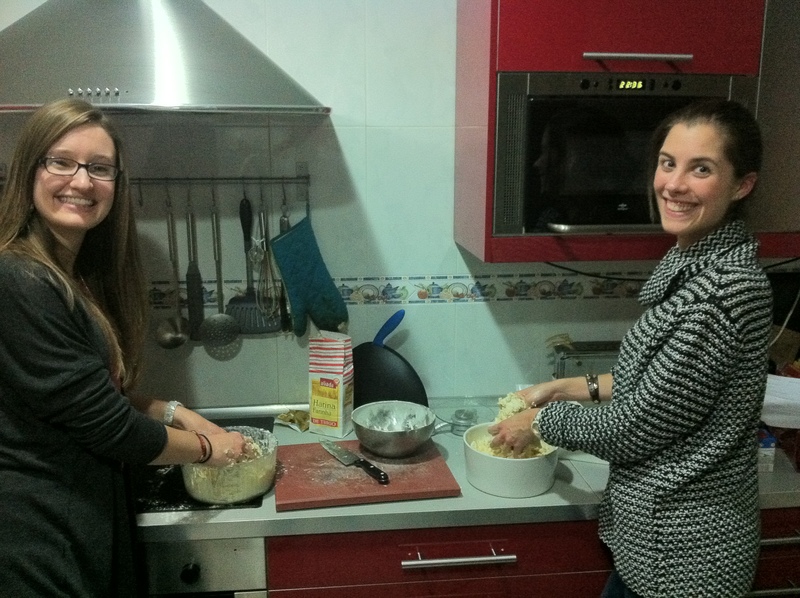 Myriam and her sister Lucia were fascinated by the mashed potatoes- which people don’t make in Spain and I gave up trying to explain gravy and resigned to calling it “Turkey sauce.” Patri popped open a (much needed at this point) bottle of red wine of the homemade variety (Guillermo’s family, like many families in Galicia, ferments its own wine) and which was deeeelicious. Then we all sat down to a feast that was mostly-American but with some definite Spanish flare. It was a massive success! 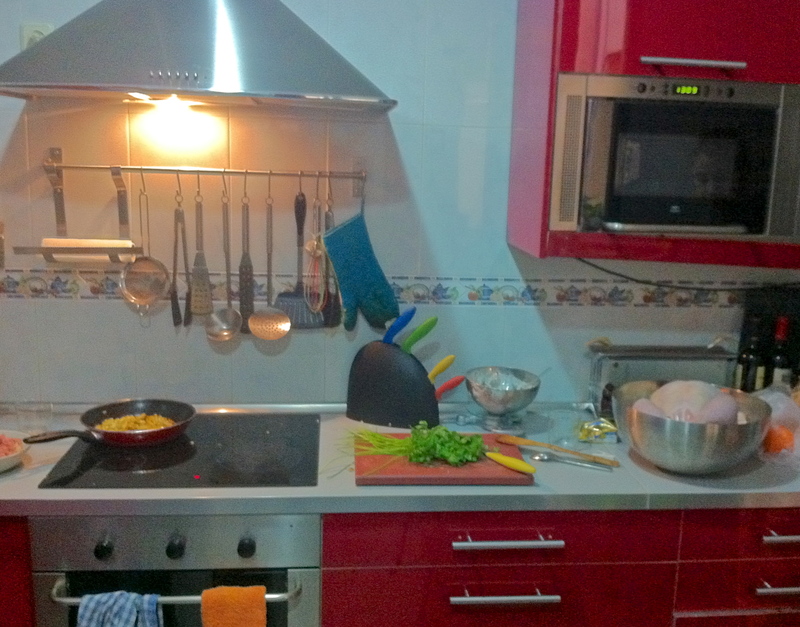 Now that we have all the appliances and cooking gear that we’ve been missing, Kassandra and I have decided that we are going to put it to use! Our next adventure: Chai cupcakes with pumpkin frosting or pumpkin pancakes with chai lattes. Gotta use up that leftover cardamom and pumpkin puree! I’ll keep you posted on how they turn out.